But ... do not understand pre-amp output. Running a JVC P3030 ( https://www.hifiengine.com/manual_library/jvc/p-3030.shtml ) pre-amp. Specs say 20V max out. Thought most amps are looking for less than 2V and clipping results if a higher voltage is send to them. So what about 20V out???? That Pre amp has + and - 37 volt rails so it can put out the 20 Vrms that is spec'd. That is a LOT of output signal capability like +28 dBu. If you want to use more of the volume control you will have to attenuate that pre amp output signal. Yes it is true most power amps will drive rated output with only 1 or 2 volts input. That is with the gain controls fully clockwise. If there are no gain controls it is expected that the source/pre amp does all the volume adjusting. If you intend to drive a miniDSP with 2 volt max input with that Pre amp it is going to be tricky. I have no hands on experience with miniDSP units, but 2V max input? Perhaps someone with experience with miniDSP will jump in. The miniDSP 2 X 4 input max is .9 volts or 2 volts, depending on a jumper setting. The output voltage, however, is set at .9 volts. If the input setting is 2 volts, the output has a 7 db insertion loss. Is the input impedance/resistance spec'd so we can build Emile an attenuator? Something is very wrong. I don't see how a pre-amp can use all those semiconductors. I think the spec for the M-3030 crept in. A 20 volt output from a power amp is not unreasonable. Thanks @babadono , @mboxler and @WMcD Sounds like that miniDSP is a piece of crap - but it is set at 2V. Don't feel like spending $1000 on a Xilica (it's just for a seperate stereo "tinkering" room and only use it as a xover). So; should I look into passive xovers, active xovers, attenuators, or??? Why not? The Japanese do (or did) things like this all the time. Not trying to pick a fight or challenge your expertise. The Japanese have bean counters too. It seems impossible to use the more than 30 transistors and FETs (combined) for a channel of pre-amplification even if cost is no object and we include the phono section. If a manual becomes available we'll know for sure. Sounds like that miniDSP is a piece of crap - but it is set at 2V. I'm not saying that. But they give no other input spec? Like headroom above 2 volts? How do you know you are clipping its input? The manual is available at HiFi Engine from the link in Emile's first post. That's how I knew it has +/- 37 volt rails. Something like this would allow you to use more of the volume control on the pre amp and cut the signal down going into the miniDSP. Its cheezy but hey its cheap. Thanks! Anyone's guess how many dB's I would need? Also found these "fixed" ones from Harrison Labs ... they come in 3,6 or 12 dB's. OK; an attenuator would solve my volume knob sensitivity (if I find out what dB's I need). But ... if I may ... one more "shot in the dark" for my speakers. The 18" JBL's seem to need some power ... haha, found a cheap Crown XLS 2502 (775W each into 4 ohms) which does have crossover settings. How about just buying that PLUS using a fixed 600Hz 12db xover for my K-510 horns? Pretty sure the horns will do 500Hz, but with the slow 12dB slope I "guess" 600Hz would be better??? OK so i think that would work but not optimally. Doesn't the 510 horn need some EQ? 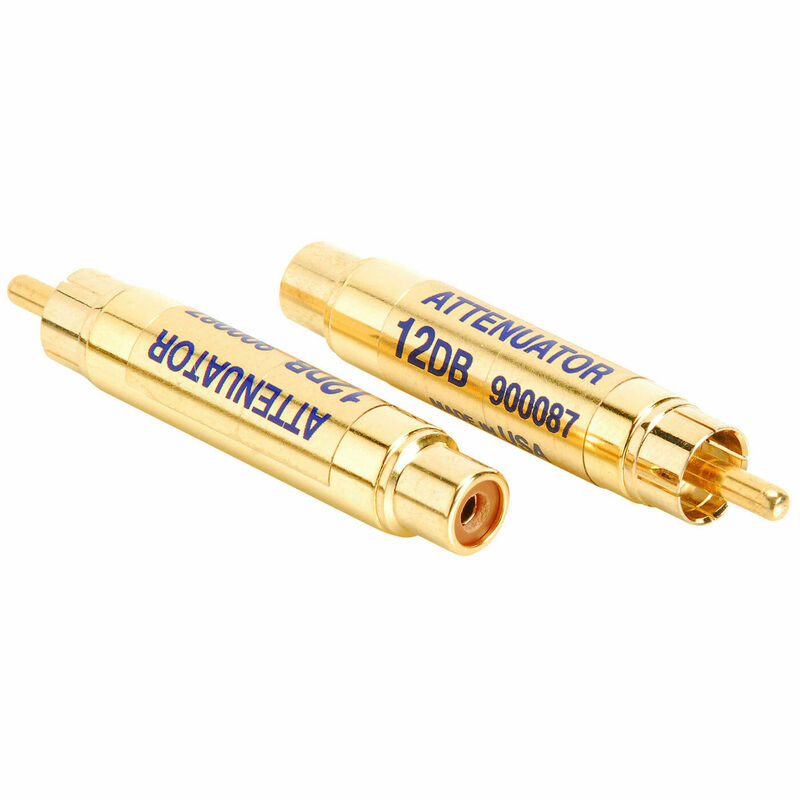 And regarding the Harrison Attenuators I think as strong as your pre is you could easily go with 12dB.These things have been discussed before and never have I been able to determine what input impedance they are designed for. And yes that is important. So I 've got a free amp coming.....SWEET.